The general editors of this series, Eva Figes and Adele King, explain that there is a need for their series of feminist readings because much of the criticism on selected women writers by male critics is usually unfair, false or simplistic (vii). 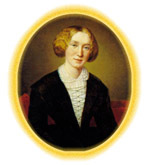 Kristin Brady very quickly and effectively proves their point in the first chapter of George Eliot by referring to many influential nineteenth- and twentieth-century male critics who were often more preoccupied with Eliot's appearance or what they judged to be her suspect femininity than with a straightforward consideration of her artistic achievements. Among such critics, says Brady, Gordon S. Haight was a prominent, albeit unwitting, offender. Brady rounds on Haight for his persistent use of two phrases, 'someone to lean on' and '[she] was not fitted to stand alone', which crop up throughout his biographical writing on Eliot. But, Bray reminds us, these phrases are lifted from Charles Bray's 'phrenological reading of Eliot's skull' (16 ft.) and are, therefore, anything but reasonable assessments of Eliot's character. Haight was not the first to cite Bray's 'diagnosis', but his tremendous influence as an Eliot scholar has meant that these particular male assumptions about a woman and her supposed frailties have been 'transformed into incontrovertible fact' (19). And this now common view that Eliot was a rather weak, potentially hysterical woman, morbidly dependent on men, has naturally affected the way her work has been interpreted. An altogether different picture of Eliot emerges when Brady recalls the biographical information without the gender definitions provided by Haight, et al., but instead takes into account Eliot's 'position as a feminine gendered subject within' patriarchy' (22). In this light, her determination not to accompany her father to church in 1842 and her decision not to marry the unidentified local artist, her eventual rejection of Chapman's sexual advances yet continued commitment to the Westminster Review, not to mention her rich and diverse artistic output, all point to an impressive ability to stand perfectly upright and alone.